210-degree Sea View Villa for sale in Calpe This superior quality Villa constructed in 2007 with Panoramic sea and Mountain views towards Calpe. 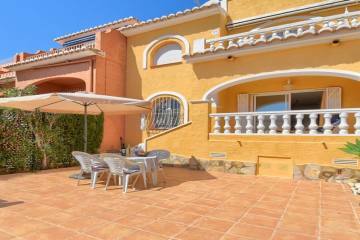 500m walking distance to the train station and 1.5km to the center of Calpe and 2km to the Blue Flag sandy beaches. A double plot of 2066m2, with space to build an additional property with a separate driveway both with automatic gates and planning approval for 2 extra double en-suite rooms on the main house. This eco-friendly property with solar panels and batteries to store energy for supplying electricity, hot water and heating the Swimming pool. Irrigation system and fresh water storage tank. 465m2 Construction finished to the heights standards using the high-end equipment. The main door leads to a large entrance area leading to a large open plan living room divided into two rooms by only three wooden steps. A large dining room with 210-degree views over Calpe, the sea and the Peñón de Ifach. Two the left of the lounge is a large fully fitted kitchen with Centre Island, Smeg, and Gaganau equipment. From both the dining room and kitchen, there is direct access to the partly glazed Naya for use throughout the year, which gives access to the pool and sun terrace. The 14x3m2 heated pool benefits from a child security automatic cover, which also helps to retain the heat overnight and reduces evaporation. The master bedroom has a window overlooking the sea, with a walk-in full height dressing room, and a large en-suite bathroom with walk-in shower. The second bedroom has fitted wardrobes and direct access to the bathroom. Stairs from this level take you up to a large roof terrace with breathtaking views North towards Benissa and North East towards Cumbre Del Sol. On a clear day as far as the Balearic Islands The other two rooms are on the lower floor, with a lounge area dedicated solely to these rooms. One room is currently used as an office the other is the gym. This area has direct asses to a double garage and a guest shower room. 2 separate main entrance gates to the property, Large terrace with open views, Solar electricity & Hot water, Gas central heating, Water softener, Drinking water filter, Decorative gas fireplace, 6 points of entry to the property of which 3 have an external key, Solarium terrace in the upper area, connected by internal stairs, Satellite Internet installed, Main Bedrooms have dual-purpose A/C units, Ceiling Fans fitted in upper living area, 2 main Bedrooms have dual purpose A/C units, Ceiling Fans are fitted in upper living area, Ceiling height in the upper area is 3 meters, Terrace has shade blinds, Roof access onto flat area, Rainwater storage tank, Biosystem wastewater A unique property in a special location with south facing uninterrupted sea views to Ifach and surrounding waters. Built to the highest standards and ready to move in. Owner looking for a quick sale. Furniture is negotiable. Calpe is a centrally placed town with good WIFI communication, good connections to the Motorway. Good choice of International and local schools. Excellent climate for all year round living. Good sports facilities including Tennis Courts, indoor swimming, 6 golf courses with 45 mins. Excellent opportunities to integrate with a Spanish and International community.